I haven't read many dystopians this year, mainly because I'm a bit bored with them after the flood of dystopians following the success of The Hunger Games. 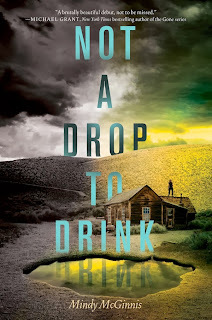 Not a Drop to Drink, however, is a dystopian that is well worth reading, with a remarkably tough heroine and a refreshingly different world. First off: I love the idea of this dystopian world! A world where water is scarce and protected at all costs? It's scary and real, and I couldn't stop envisioning it actually happening. Let's just say that, after finishing this book, I had an incredible urge to start stocking up on water. And the world-building is subtly slipped in as the book moves along, so that we learn more about the world without it ever feeling like an info-dump. Oh, I just adored all the characters. I loved Lynn as a heroine. I don't know why, but I tend to gravitate toward tough, emotionless heroines like her. Others might find her character too cold and distrustful, but personally I loved the grittiness of it. It's easy to see how the way Lynn was raised has made her into such a tough girl. I loved the secondary characters, such as Lucy, Stebbs, Eli, and Mother. It was very sweet to see how people such as Stebbs and Lucy - strangers to Lynn - eventually worked their way into her heart as she started to open up. It's been a couple weeks now since I've finished Not a Drop to Drink, and I still catch myself thinking about this book. What stands out most about it is the realism: from the world-building to the characters to the plot, it was all done very realistically, and the author does not hold back in any way. I loved this. If you're looking for a realistic dystopian novel with a serious tone and smart heroine, then this book should be first on your to-read list. (And hey - it's not another dreaded trilogy! Yay!) I know for sure that I'll be reading more of McGinnis's future work. Oh, yay, glad you liked it! I haven't read it yet, but it's in my ever ending TBR pile. But, I'm with you on getting bored of dystopians, there seems to be tons every year, some well developed with an actual story to tell, and some...just because it's a popular genre right now. I haven't read too many either, but the ones I have, haven't been too bad. But, I'm with you on the emotionless characters, It definitely creates more atmosphere and makes it more realistic. "I had an incredible urge to start stocking up on water" Haha! But seriously, it is quite scary, and I drink like 3 litres of water a day, so I'd be screwed. Yes, this is definitely a unique dystopian. Haha yeah, the whole running-out-of-water idea is very scary! Thanks for the thoughtful comment. :) I hope you get to read it soon; I'll keep an eye out for your review!